Before you go fishing in the Ebro Delta you should note that Deltebre is worldwide considered as the best fishing destination in the Ebro Delta and in the Mediterranean. Its calm waters are rich in nutrients and host a wide variety of native species. Carps, sea bass, gilthead bream and ray’s bream live in the river alongside other species introduced by man such as the European catfish ant the mosquito fish. If you are an angler, you will really enjoy the opportunity to go fishing with local expert fisherman! The best season for recreational fishing in the Ebro Delta is from May to November, when most of the species come to these waters. In any case, the large amount of nutrients that feed the Ebro River allows having many fish species all year round. Night fishing can be an amazing experience. Remember to wear long-sleeved clothing to protect yourself better from humidity. Take sunscreen and enough water with you if you want to go fishing during the day, especially in summer. And do not forget your mosquito repellent if you want to keep mosquitoes away. Club Nàutic Riumar organises fishing competitions in the calm waters of Deltebre. It is a great opportunity to show your talent and enjoy a nice day surrounded by nature. More information. 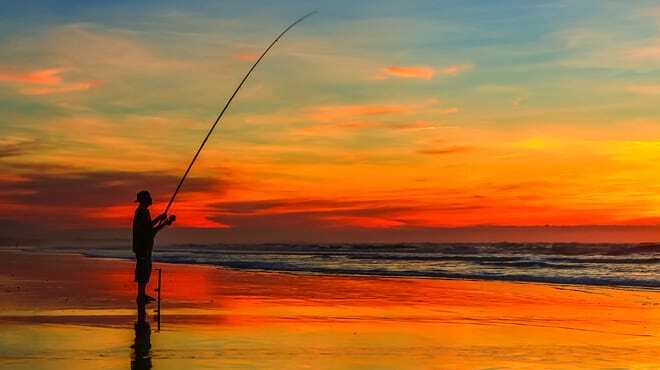 Deltebre is a paradise for the enthusiasts of both freshwater and sea fishing thanks to its privileged location next to the river and the coast. Rent a boat in one of Deltebre’s sportfishing centres or make one of their fishing trips. Embark, relax and good luck with the fishing! More information.